Records show that there was a church located here since 1787. When Bishop Plunket visited the area in April 1798 he recorded, “compliments paid on the repairs of the chapel of Muffin which a new altar was erected”. It was T-shaped in structure and remained in use until 1858, when Fr. O’Reilly built the present church. 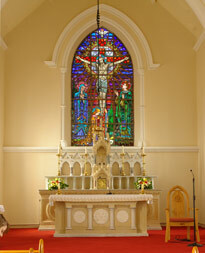 Harry Clarke’s Studio designed the Crucifixion Window, behind the main altar in the new church. It shows the Blessed Virgin and St. John at the foot of the Cross with Mary Magdalene kneeling embracing it. The skull depicted beside the foot of the Cross identifies the place as Calvary, and it is shown, to symbolise the victory of Christ over death, by its sacrifice on the cross. The window was a gift from Mrs. Rose Bradley of Edenagora and is a demonstration of the finest workmanship and attracts many visitors each year. In 1974 the Dublin Glass Company fitted a stained glass window above the main door. It is depicting the Assumption of Our Lady and was a gift from Mrs. Coleman, Rocks Road, in memory of her parents. In 1977 the church was renovated and reopened on Christmas Day. 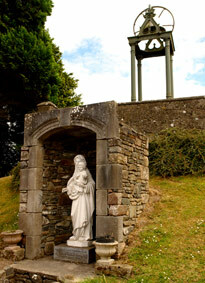 To mark the year 2000, a local committee decided that a Grotto in the honour of Our Lady of Mount Carmel would be erected in the church grounds as a fitting memorial of the great Jubilee. The Grotto was erected during the early summer and blessed by Most Rev. Michael Smith, Bishop of Meath on the feast of Our Lady of Mount Carmel on the 16 July 2000. As part of the jubilee celebrations, Bishop Smith joined in the pilgrim walk with several hundred pilgrims starting from the old Mass Rock on Loughanleagh to the Church.